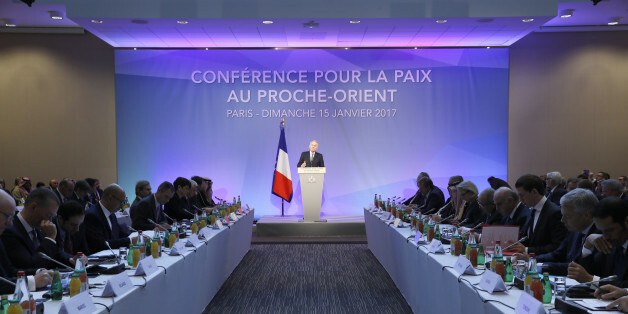 The conference for peace between Israel and the Palestinians initiated by the French government that took place on January 15 in Paris was positive in many ways. The concluding declaration that collectively emerged pointed out the need to establish a Palestinian state as a prerequisite to peace and stability, urged the two sides to recommit themselves to a two-state solution, and emphasized the urgent need for both to take action to reverse the current trends of Palestinian incitement and Israel's expansion of the settlements. Furthermore, it called for ending the occupation and accentuated the importance of the 2002 Arab Peace Initiative (API) to provide the framework for a comprehensive Arab-Israeli peace. The resolution also stressed the importance of public debate, strengthening the role of civil society, and addressing the humanitarian and security situation in Gaza. Perhaps one of the most important reasons, however, for holding the conference only a few days before the inauguration of President-elect Trump was to send a message to the new administration about the international consensus regarding the Israeli-Palestinian conflict, hoping to prevent Trump from taking any measure that might threaten the prospect of a two-state solution. Of main concern to the conferees was Trump's campaign promise to relocate the American embassy from Tel Aviv to Jerusalem and give Netanyahu a free hand to expand the settlements, which could torpedo the prospect of peace and provoke the Arab states at a time when they are needed to support any new peace initiative. Although the resolution was largely on target, it lacked specific suggestions that could be embraced by the Trump administration to help advance the peace process in a tangible way. I was directly involved in an effort to shed new light on the core issues that have and continue to separate the two sides, and I suggested specific measures to mitigate them -- issues which I considered critical to the resumption of the negotiations that would substantially improve the prospect of reaching a durable peace. To that end, I wrote a major proposal which I discussed with top French Foreign Ministry officials. Subsequently, Pierre Vimont (France's Middle East Special Envoy), EU Special Representative for the Middle East Process Fernando Gentilini, and I addressed the EU Foreign Relations Committee in November 2016, where I emphasized the need for a new approach. There were many areas in the conflict over which Mr. Vimont and I fully agreed -- and were reflected in the final declaration of the conference -- and other issues which were not spelled out. In my view, had such issues been clearly stated, they would have revealed the real causes behind the stalemate in the Israeli-Palestinian conflict and offered ways to mitigate them. The first issue is the psychological dimension of the conflict and its impact on every conflicting issue. Unless major efforts are made to change the public narrative on both sides to reflect the truth from historical and religious perspectives, neither side can make the far-reaching concessions necessary to forge a peace agreement. The need to mitigate that through a process of reconciliation -- people-to-people and government-to-government -- is central to constructive negotiations. Such a process would allow both sides to nurture mutual trust, which is totally lacking, and allay concerns over national security, while also disabusing strong Israeli and Palestinian constituencies that still want to have it all. The second issue is Hamas and its political stance, which has and continues to impede any progress. The conference's resolution stipulates the "importance of addressing the humanitarian and security situation in Gaza and called for swift steps to improve the situation." Although this is necessary, as long as Hamas calls for the destruction of Israel and is not a signatory to the API, it plays into the hand of the hard-core Israelis who claim that the Palestinians simply want to eradicate rather than peacefully coexist with Israel. The conference should have called on Hamas to accept in principle Israel's right to exist and beseeched countries like Turkey and Qatar, who enjoy substantial influence on Hamas, to embrace the API. This is necessary particularly because Hamas must be part and parcel of any final resolution to the conflict. Third, although the participants "expressed their readiness to exert necessary efforts toward the achievement of the two-state solution...," who will exert such efforts -- economic and other incentives? I took the position that the conferees should have established a commission composed of representatives from an Arab state, the EU, and the US to encourage the parties to take certain steps, review progress, and pin down the sources that impede it. Otherwise, the recommendation will be just words. Fourth, the conferees call for " ending the occupation...satisfy Israel's security need, and resolve all permanent status issues on the basis of [UNSC] Resolutions 242 (1967) and 338 (1973)..." This appeal is certainly valid and no solution is possible unless these requirements are met. Here again, though, there is nothing new. The participants should have also recommended the establishment of another commission to work closely with both Israel and the Palestinians to begin modifying their public position on several of the major conflicting issues. For example, everyone who is familiar with the conflict knows that the right of return of the Palestinian refugees cannot and will not be exercised, as this will almost instantly change the Jewish character of Israel. The Palestinian Authority should begin to speak publicly about the only viable option to resolve the Palestinian refugees through compensation and/or resettlement. Similarly, Israelis should also know that there will be no Israeli-Palestinian peace unless East Jerusalem becomes the capital of the state of Palestine. Here too, the Israeli public must begin to think in these terms and not buy into Netanyahu's argument that a "united" Jerusalem will remain the eternal capital of Israel, which would foreclose any prospect for peace. To be sure, even though the conferees do not have any power of enforcement, by opening public debates on these issues they would have made a positive impact on the peace process. In the final analysis, as long as the Israeli and the Palestinian publics are led by leaders who do not promote the peace process along these lines and have different political agendas not necessarily consistent with a two-state solution, the public will remain in the dark and to a great extent become complacent. There is an urgent need for new leadership committed to reaching an agreement. Netanyahu will not allow the establishment of a Palestinian state under his watch and Abbas is incapable of delivering the necessary concessions that could make peace possible. The conference could have made a great contribution to the peace process not by merely repeating what is known, but by fostering a new dialogue that allows the public to become an active participant, which is critical to changing the dynamic of the conflict.